Drelas' Cottage is an isolated cottage at the foot of a mountain in northern Whiterun Hold, and south of Morthal. It is home to Drelas, a powerful elemental mage who will attack on sight. It consists of one zone, Drelas' Cottage. Drelas' cottage is a spacious residence sectioned off into a few areas. The ground floor consists of a fireplace and food area, a small alchemy and enchanting space, and a spacious sitting area, while the bedroom area can be found upstairs. Upon entering the front door, a large table will be to the right, holding a leveled potion, a sample of elves ear, a gourd, a fly amanita mushroom, a deathbell, two chicken's eggs, a dragon's tongue, an orange dartwing, a nirnroot, two pine thrush eggs, a thistle branch, a sample of tundra cotton, a cluster of juniper berries, a sample of wheat, and a serving of grilled leeks. A large floor fireplace sits in the northeast corner, and the room holds two respawning large sacks—one along the wall between the door and the table, and the other in the northwest corner. Proceeding through the doorway to the next area of the cottage, a small alchemy and enchanting space can be found on the north side. This is where Drelas is likely to be found during the day. On the right side of this space is a small set of shelves holding a copy of Galerion The Mystic and a thistle branch on the top shelf, and two blue dartwings on the bottom shelf. 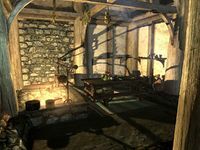 An alchemy lab is situated in the corner, with two wall shelves above—the right holding a non-respawning large sack, and the left holding a sample of vampire dust. Two spider eggs and a respawning large sack sit in a small crate to the left of the alchemy lab. At the top of the next set of shelves along the north wall is a sample of hagraven feathers, while a leveled magicka poison and a sample of bone meal can be found on the top shelf, and the bottom shelf holds a sample of glow dust, two deathbells, and a sample of ice wraith teeth. The arcane enchanter sits in the left corner, to the left of which rests a large silver bowl containing three scaly pholiota mushrooms and two sabre cat teeth. The remaining portion of the ground floor is a spacious sitting area, with the stairway leading to the bedroom upstairs. Along the railing separating the rooms on the east side, a small table is set with an apple pie, a bottle of wine, and a bowl containing two potatoes. In the southwest corner, a desk holds another bottle of wine and a copy of The Firmament, while a bookshelf holds a sample of vampire dust, a thistle branch, and one copy each of the following books: Life of Uriel Septim VII; Brief History of the Empire, v4; The Real Barenziah, v3; Ruins of Kemel-Ze; Yngol and the Sea-Ghosts; and Biography of Barenziah, v3. Beneath the stairway are three respawning food barrels, one of which holds a respawning large sack, while another holds a draught of strength, a leveled potion, and a sample of tundra cotton. Another respawning sack sits in front of the southernmost barrel. Heading upstairs, you'll find a small non-respawning cupboard directly ahead, atop which sits a glazed bowl containing two goat cheese wedges. Against the wall to the right is a non-respawning dresser holding a bottle of ale and another copy of Biography of Barenziah, v3. Turning the corner, there are two tall bookcases along the wall to the left, and a single bed in the main bedroom space on the right. At the foot of the bed is a respawning chest containing leveled items, and to the right of the bed is an end table holding a potion of plentiful magicka and a bottle of alto wine. 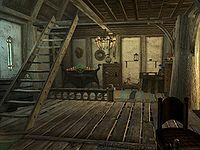 On the bookshelves are two samples of lavender in a basket, a sample of tundra cotton, and a basic poison, as well as twelve more books: The Real Barenziah, v3; Antecedants of Dwemer Law; two copies of The Firsthold Revolt; two copies of The Cake and The Diamond; two copies of The Hope of the Redoran; The Book of Daedra; Frontier, Conquest; Mysterious Akavir; and The Real Barenziah, v1. The door is not locked, but entering the cottage still counts as trespassing. 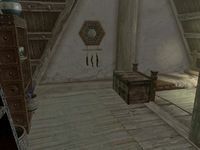 Additionally, items in the house, other than those looted from Drelas' corpse, will remain owned by Drelas upon his death and will be marked as stolen if taken. The cottage is a hot spot for dragon encounters due to the nearby word wall at Eldersblood Peak. Two deer or elk are likely to be found nearby. All cupboards, dressers, and end tables in the location are non-respawning. The door to Drelas' cottage is owned by Ulfberth War-Bear. This page was last modified on 7 January 2019, at 04:23.